The other night I went to the splendidly refurbished Gielgud Theatre. The interiors of many of these old London theatres are almost like an artwork in their own right and it's worth attending a show just to get inside. 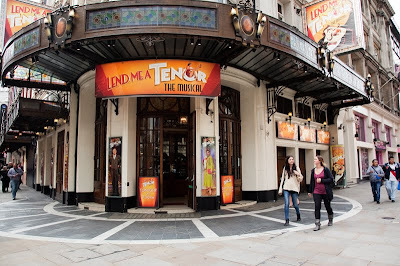 I saw Lend Me a Tenor a musical comedy of mistaken identity, charades and surprising romance. It was a fun production and made all the better by it's fabulous set and surroundings. No one does theatre like the British, would love to see interior Mo. I have many fond memories of theatres in London. Whenever I visit I always manage to go at least twice. I've seen some amazing shows in beautiful settings. This is right up my alley, Mo. I love old theaters and I love theatrical productions. We are all waiting for some interior shots now. Hah! I bet cameras were forbidden inside. We have a wonderful old theatre in Sydney and boy, was I rapped over the knuckles.